If you are already in Vienna, Budapest or Prague you might get the idea to visit Bratislava as well. Bratislava is the capital of Slovakia, located on the border to Austria and Hungary. It’s just one hour from Vienna which makes it the perfect day trip. Many tourist just spend one day in Bratislava. Bratislava is absolutely worth visiting if you haven’t been here yet. Travelers usually spend maximum two days in Bratislava. This is enough time to explore the main sights of the city and even try some good Slovakian food. I visited Bratislava hundreds of times and even lived there for a few months. In this article, I will show you what places to visit in Bratislava and what’s worth seeing. My honest guide about sightseeing in Bratislava will help you get around in the city, visit most popular places and try the most authentic Slovakian food. This itinerary will give you some options on what to see within one day in Bratislava. 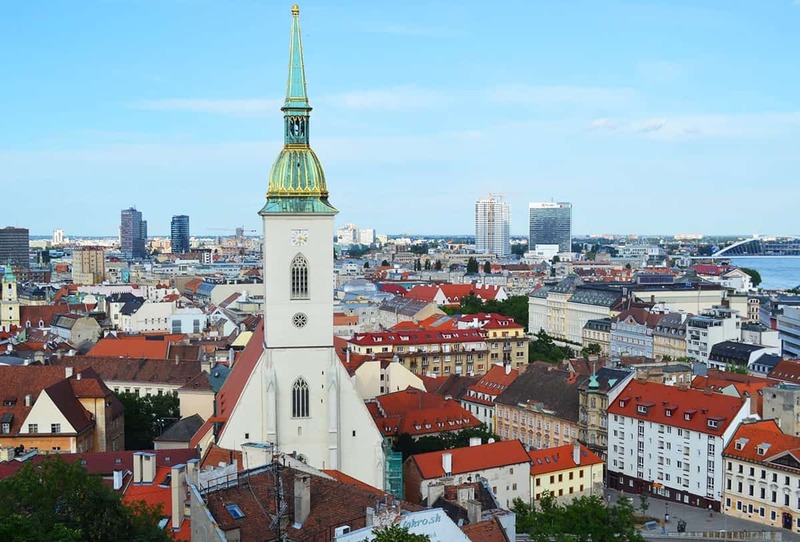 Two days in Bratislava – what to do? If you plan to arrive by car, you will probably want to use one of the highways leading from Vienna, Budapest or Prague. Be aware that you will need to pay a toll. Hungary and Slovakia have an electronic toll system in comparison to Austria, where you will need to put a sticker on your windshield. You can buy toll tickets at the border or at any gas station. If you plan to rent a car, I suggest comparing car rentals at rentalcars.com. I only had good experiences when renting a car through them. There are excellent train connections from Vienna, Prague, and Budapest to Bratislava leaving almost every hour. For timetables view: Oebb.at or Cp.sk – make sure to switch to the English version before starting your search. The cheapest way to get to Bratislava is by bus. There are several bus companies that offer bus connections from Vienna Airport, Prague or Budapest to Bratislava. The most convenient bus company with wifi on board is flixbus. 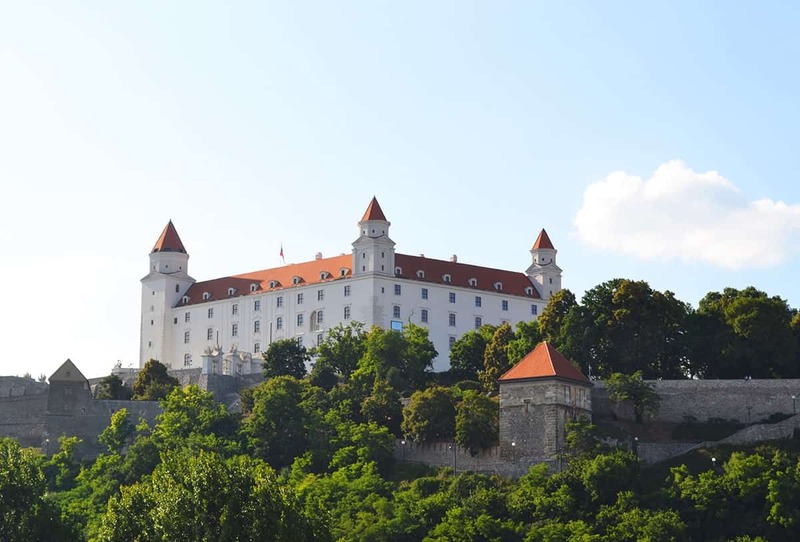 In case you arrive at the main train station in Bratislava, you don’t need to hassle with public transport as you can walk to most of the points of interest in Bratislava. If you arrive at the airport, take the bus N. 61 to Hlavna Stanica (central train station), from here take the N. 93 to Zochova which is right in the downtown. The trip should take you around 50 minutes. From the main bus station take the bus N.210 to Hlavna Stanica (central train station). You can check your exact bus route here. Reduced prices are valid for students with a valid student identity card. You can purchase transport tickets in any newspaper stand or at the ticket machines in front of the bus stations. Make sure you have enough coins, as you cannot pay with a credit card. Without further ado, let’s look at the sightseeing options you have in Bratislava. 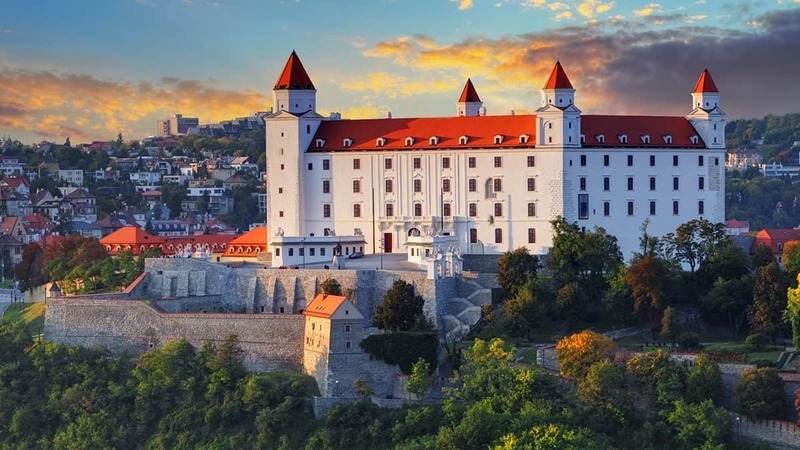 Visiting the castle in Bratislava is a must. It’s the most iconic building in the town, right above the Danube river. From the top, you will have a 360-degree view of the city. You can even see all the way to Austria from there. It’s a great spot to take pictures and even a good place to visit in the evening when the city lightens up. Right below the castle, you will find the historic city center with interesting buildings such as the St. Martin’s Cathedral, the Slovak National Theater, Town Hall, the Government Office, and Michael’s Gate. A bit of the beaten path you can also go visit the Blue Catholic Church which is just ten minutes away from the town hall. In case you get hungry, one block away towards the city center there is a underpass from Gajova street to Grösslingová street where you can get Slovakian pirozhki. If you are around, you need to try them. I always got some when I was a kid and walked by. You have probably noticed that there is one significant bridge with an UFO on top. This bridge (called SNP) is connecting the other side of the city with downtown. If you are arriving from Hungary or Austria you might actually cross it. You can visit the restaurant on top, just be aware that you will need to pay for the elevator to bring you up, as there are no stairs available for the public. On the other side of the Danube river, you will find the park Sad Janka Kráľa. It’s a good place to relax and take a break from sightseeing in Bratislava. On the riverside, you will find some houseboats serving local and western food. It is also a good spot to get another perspective on the city center of Bratislava, dominated by the view of the castle and the bridge. 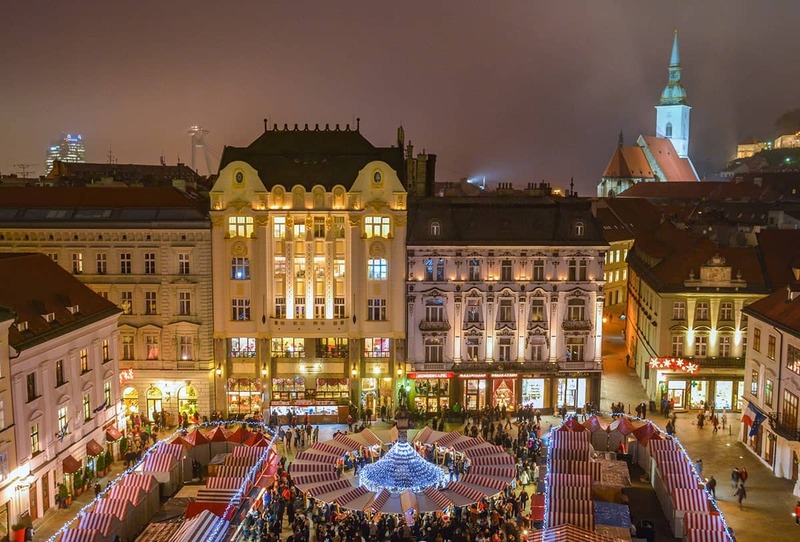 Christmas markets in Bratislava is, in my opinion, the best thing to do in Bratislava in winter. It creates such an amazing and cozy atmosphere. As the city center is quite compact, you can hop from one Christmas market to another one, enjoy hot wine and some delicious local meals. Personally, I enjoy Christmas markets in Bratislava more than in Vienna as it’s more compact and the prices are also more affordable. 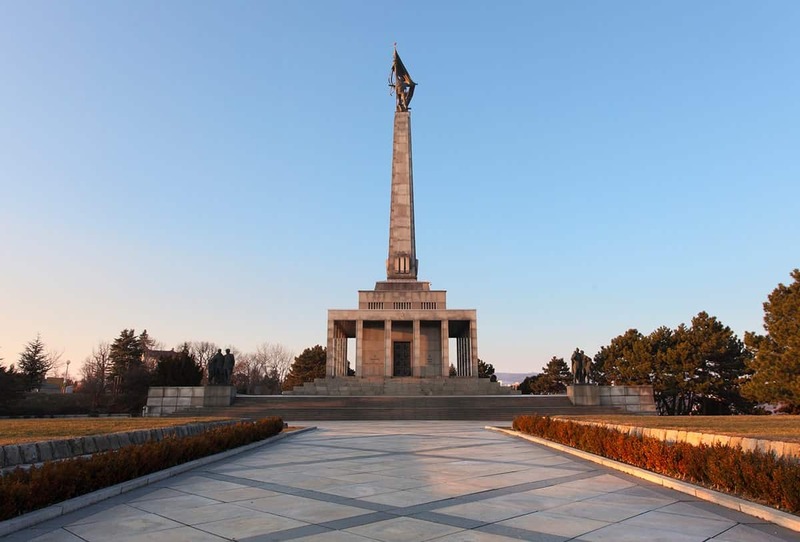 Slavin is a memorial and cemetery of the Soviet Army soldiers from World War 2. If you are into history this is a place to see in Bratislava. Additionally, you get a nice view of the city from another perspective. It takes you approximately 20 minutes to get there from the main train station. You can bookmark the location here. 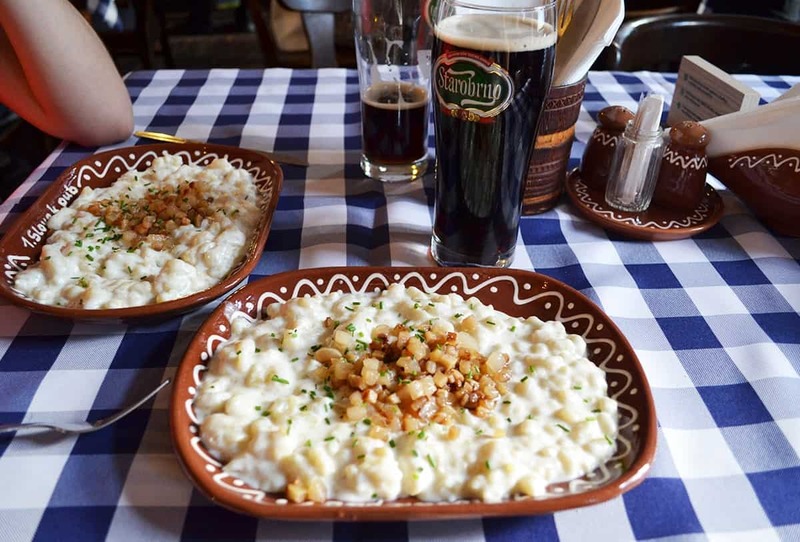 Apart from sightseeing in Bratislava, you should reserve enough time to have a proper Slovakian meal. 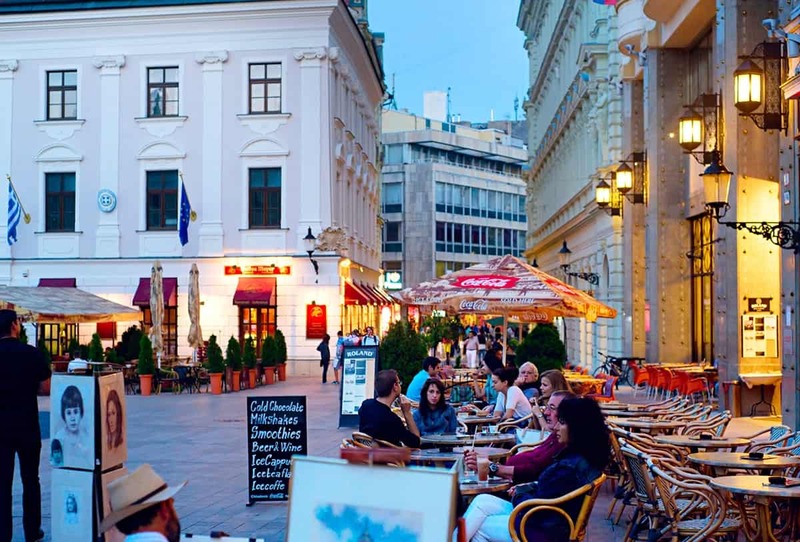 Bratislava has a lot of options to try authentic Slovakian food. My go-to place when I bring friends to Bratislava is the Slovak Pub. It’s the closest and best pub in the city center where you can get local food. A typical local meal will cost you less than € 5. Another authentic pub I like is called Bratislava Flagship, just a few minutes walk from Slovak pub. In case you decide to stay two days in Bratislava you might be interested in day trips you can do around the city. Devin is a ruin 20 minutes bus drive from Bratislava. 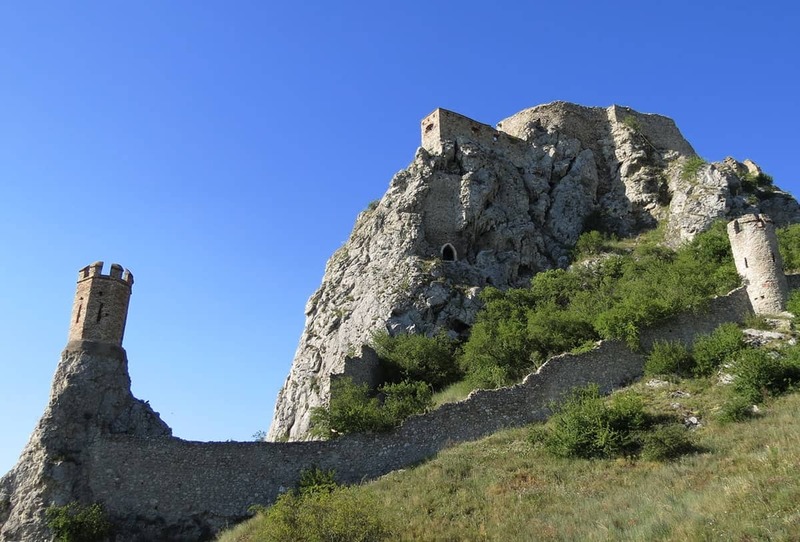 It’s just above the intersection of two rivers Danube and Moravia. You can get there from the bus station under the bridge SNP with bus number 29. This place played a huge role in the history of the country as more than 25 years this was the location where the iron curtain separated the eastern block from the west. Zlate Piesky is a small lake just in the suburbs of Bratislava. It’s a good place to relax, rent a paddle boat, swim in the summer or do some wakeboarding. You can get there from the city center within 30 minutes with the tram number 4. Visiting Koliba and the tv tower offers a good option for people who like to hike. You can start the hike from Zelezna Studienka. It is a nice afternoon walk through the woods combined with a short lift ride to Koliba. If you are into BBQ I suggest taking some sausages and bread and grill them on one of the public fireplaces. Many travelers go to Bratislava to experience the nightlife. Cheap hostels, inexpensive drinks, good bars, and clubs make it a good destination for backpackers. In most of the clubs in Bratislava, you will need to pay admission. Women have mostly free entrance. If you decide to extend your one day trip to Bratislava I have good news for you. The accommodation in Bratislava is very affordable. 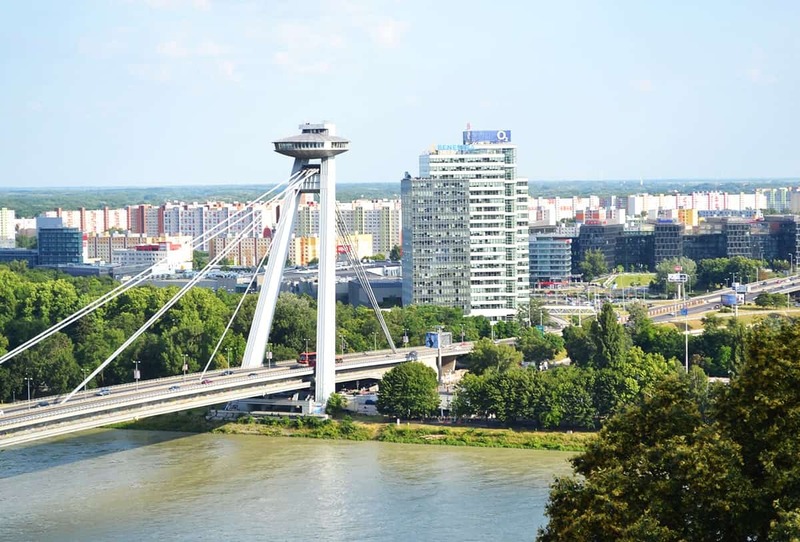 Here are a few options for stays in Bratislava close to the city center. If you prefer to use Airbnb, here is my discount code which will save you € 30 on your first booking. If you already have an Airbnb account, you can create a new one with a different email to redeem the coupon. My post about the best places to visit in Bratislava should give you an idea about things to do in order to enjoy your stay. You should not leave the city without trying some Slovakian food. Food tasting is one of my favorite activities to do in Bratislava. Let me know how you enjoyed your visit to Bratislava in the comments below. fantastic video, I remenber that….hehe…..whem you will come to visit Brazil?